The primary objective of risk mitigation strategies in aviation SMS programs is usually detailed as being a plan to implement risk controls that reduce the likelihood/severity of each identified specific risk. However, this risk mitigation plan in limited in that it does not address the mitigation of hazard occurrence. Despite the fact that oversight agencies generally stress risk mitigation as being accident centric, aviation SMS programs should include hazard-mitigation and risk-mitigation strategies. So, when we talk about risk mitigation, we include hazard mitigation in this conversation. Risk Mitigation Strategy: plan, method, and control used to lessen likelihood/severity for each potential risk/mishap occurrence. In the following strategies, “risk” is usually used in the sense of “a specific risk,” such as an accident, mishap, etc. Specific risk is associated with risk analysis and mitigation, whereas risk in general is associated with risk assessment. Here are the 5 risk mitigation strategies in aviation SMS programs. The risk avoidance strategy is probably the second most common in aviation SMS programs. This strategy revolves around avoiding a specific risk occurrence by limited or non-participation in activities that allow the hazard or specific risk occurrence. Non-participation in the operation, procedure, etc. This strategy can only be done when there are multiple activities, operations, etc., that can be used to accomplish the same mission. Fortunately, most missions can be accomplished in multiple ways. Having list of criteria that automatically cancel operation (such as certain fog level prohibiting landing). Risk avoidance is usually a part of a decision for “go” or “no-go” at the beginning of an operation. Risk reduction is the practice or keeping a particular action, behavior, procedure, etc., to a minimum, or adopting actions to reduce severity. 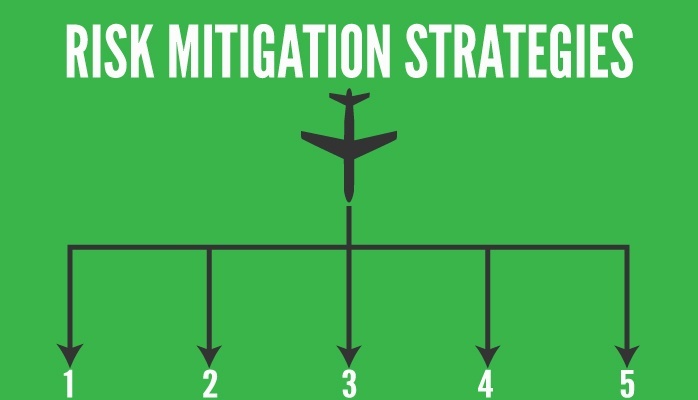 This strategy is probably the most common risk mitigation strategy in aviation SMS programs. The first purpose of this is to reduce the corresponding frequency of a particular hazard or risk occurrence. This effectively means that half as many runway incursions will occur in the given time period due to limiting the number of times that procedure was practiced. This change gives the maintenance check crew much more time get off the runway in the event of a runway incursion, thus reducing the severity should this runway incursion hazard lead to mishap (i.e., instead of collision >> evasive maneuver, landing gear damage, etc.). Risk transfer is the practice of changing responsibility of a hazard/risk by giving it to another party. The other party should be aware and accept this change of risk ownership. As such, this hazard/risk transfer is binding by law because it is contractual in nature. It is within our defined level of acceptability. Such hazards and risks should be regularly monitored and reviewed to ensure that they maintain acceptability. Between multiple duties and roles. Keeping fuel stored in special containers (i.e. ISO containers). Loss reduction – this is included as a part of a Risk Reduction strategy. Published September 2017. Last updated in March 2019.